Hide My IP는 어떤 원리 인가요? When your computer connects to the Internet normally, it is assigned an IP address by your Internet Service Provider. This IP address is used to keep track of your communications with all websites or any program that connects to the Internet. This is known as a Direct Internet Connection. When you install and run Hide My IP on your computer, it will modify your Internet Connection Settings, telling your computer to make connections through a Fake IP Relay provided by Hide My IP. 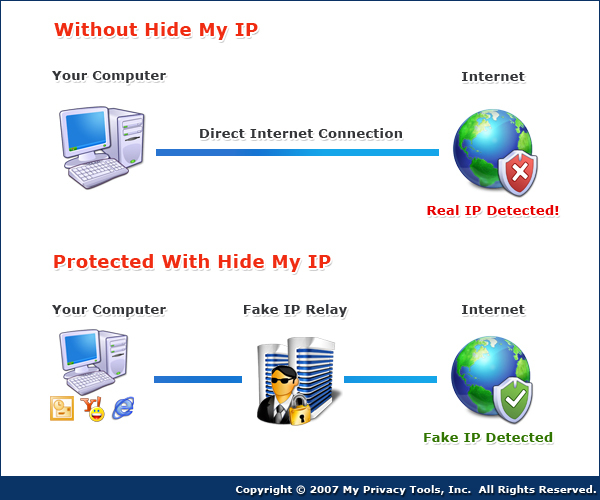 Hide My IP is compatible with many web browsers such as Internet Explorer, FireFox, Netscape, Opera browsers. All websites visited or E-mails sent using these browsers will show you are connecting from one of our fake IP addresses. With our High-Speed Premium Service add-on to Hide My IP, you can also hide your IP in many other applications such as Outlook Express, MSN Messenger, AIM, WinAmp, Putty, Trillian, ICQ, Yahoo Messenger, Windows Mail, and much more. You can view a list of all programs supported by our Premium Service..
당신이 일반적으로 인터넷을 검색하면 컴퓨터가 당신이 방문하는 웹 사이트에 직접 연결합니다. Hide My IP 를 실행 함으로, 익명 프록시 서버의 IP 로 표기됩니다. 당신이 방문하는 웹 사이트는 당신의 본 IP 를 확인 할 수 없으며, 당신의 신분을 지킬 수 있게 됩니다. 가상 IP 들은 어디의 위치 해 있습니까? Hide My IP 의 가상 IP 는 전 세계 에서 무작위로 선택하여 뽑히게 됩니다. 선택된 IP 는 자동으로 브라우저, 이메일, 게임 밑 프로그램들에 적용되며 당신의 신분을 은폐 시켜 줍니다. 무제한 평생 지원. 지금 당장 주문 하세요!